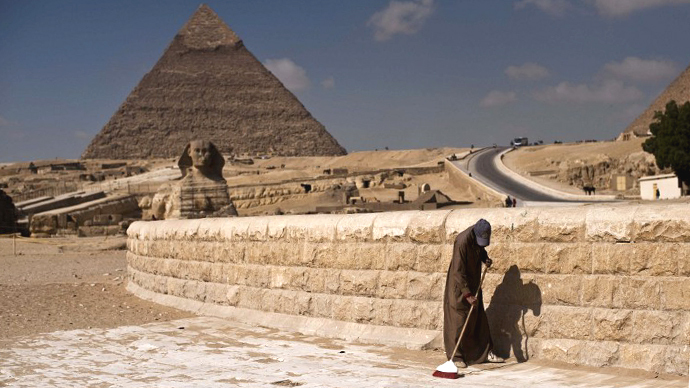 Renting out Egypt's iconic landmarks, including the Giza Pyramids, to international clients could rake in up to $150 billion over five years, according to a proposal aimed at boosting the economy submitted to the country's antiquities ministry. The proposal was authored by Egyptian intellectual Abdallah Mahfouz, who argued that renting historical sites could help breathe new life into the country’s economy. Earlier this week, Adel Abdel Sattar, Egypt's secretary general of the Supreme Council of Antiquities, reportedly confirmed in an interview with local station ONTV the existence of the proposal to rent Egypt’s main monuments – including the pyramids at Giza, the Sphinx, the Abu Simbel Temple and the temples of Luxor – to international tourism firms. “But is it possible that we rent our monuments? … This is our heritage, our roots,” the official was quoted as saying. Sattar said he received a request from the Finance Ministry to study the proposal, which has sparked outrage from local archeologists and their international counterparts. "Cry dear Sphinx, people want to rent you out and maybe later cut you into pieces and sell you! Shame on those who want to rent you. You are the symbol of dignity, power and Egypt’s ancient civilization," Egyptology professor Ahmed Saeed of Cairo University wrote on his Facebook page, according to Ahramonline. The country's antiquities ministry has reportedly rejected the controversial plan, which became the talk of the town and gave rise to various rumors. The Gulf state of Qatar reportedly expressed interest in renting Egypt’s landmarks for five years for $200 billion, according to Al Arabiya. While financial hardships have weakened the country’s economy, protests have also paralyzed the country's tourism industry.